Every month, the chickaDEE team creates a package of interactive stories, puzzles, animal features, and science experiments to educate and entertain readers. Each issue is based on a different editorial theme, like space or the world of insects. 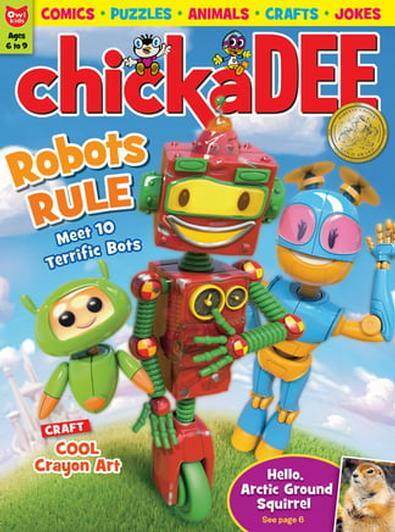 Right from the first page, the magazine’s title characters Chick and Dee greet the reader with learning and laughs. The You Asked? column fosters kids’ intellectual curiosity while promoting real engagement with magazine editors. Brain-teasing puzzles, fun animal facts, unique crafts, simple science experiments, and rich, engaging fiction round out chickaDEE’s pages, providing hours of enjoyment, whether read alone or with the help of an adult. ChickaDEE magazine is proudly designed and printed in Canada.